Place chicken breasts between layers of plastic wrap and using a rolling pin or meat mallet, pound until flattened out to about 1/4″ thick. 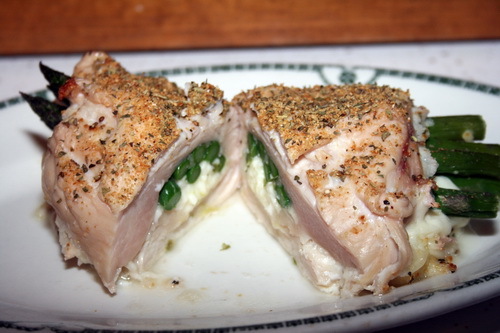 Spread layer of minced onion on inside of chicken breast, then on one end, place 5-6 asparagus spears, and cheese. Roll chicken breast up like a jelly roll, and place in a 9×13 baking dish. Repeat with remaining breasts. Sprinkle tops lightly with dried spices. Bake for 25-30 minutes, or until juices run clear and chicken is no longer pink.